The pictures shown are the actual physical Aston Martin DB11 hire car that we have. PB Supercar Hire is not a hire broker and owns its entire fleet, we can therefore guarantee the availability and condition of our cars. Fully comprehensive insurance is included with all Aston Martin DB11 hires and short term leases, we do not allow you to self insure. Our Aston Martin DB11 hire options allow you to enjoy the latest 4 seater sports car from our Aston Martin hire range. This DB11 sets new standards in its class due to its astonishing combination of agility, smoothness, beautiful design and hand craftsmanship. Hiring an Aston Martin is an event every person should experience in their lifetime. The Aston Martin DB11 is a car that ticks all the boxes- it has the history, the image, and the craftsmanship. If you choose to hire this Aston Martin DB11 from PB Supercar Hire you will be left with a smile etched on your face for days! The Aston Martin DB11 is one of the classiest supercars and brands around today, with the name synonymous with style, class and prestige. Our Aston Martin DB11 rental car is in a simple traditional colour rather than the bright colours of the Lamborghini,s and Ferrari's, but aren't as understated as our Bentley's or Rolls Royce. The Aston Martin DB11 we have for hire was designed by Aston Martin's head of development Marek Reichman, and has an amazing sounding soundtrack powered by a 5.2 litre, v12, twin supercharged, 600 hp engine, although there is also a V8 model on the market. Both engines are hand built by a single technician over a period of around 30 hours. The technicians name is also stamped onto the engine plate. 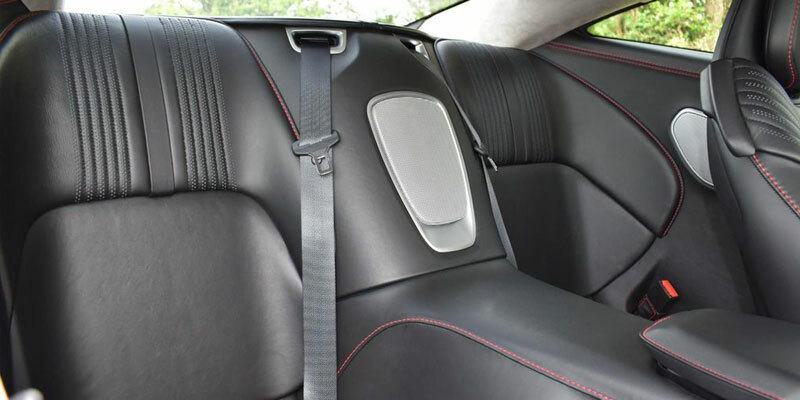 This detail shows the bespoke tradition and quality that Aston Martin has shown over the years. on not only this DB11 rental car but all the models. The engine on our Aston Martin DB11 rental car produces 600 BHP giving it a top speed of 204 mph and getting to 0-60 in less than 3.6 seconds, more than enough to have plenty of fun on the roads giving it the same figures one of our Audi R8 hire cars . Although we only currently have one model variant of the DB11 for hire , there are 5 models currently in production, these may possibly be added to the fleet at some point- the Aston Martin DB11 V12 hire car, the Aston Martin V8 hire car, the Aston Martin DB11 Volante hire car, the Aston Martin DB11 AMR hire car and the Aston Martin DBS Superleggera hire car. The DB11 V12 is the first car Aston Martin has used with a supercharged engine and is built in house, where as the V8 engine comes from partnership with Mercedes AMG and is a little slower with a 0-60 of 4 seconds and 503 hp. The Aston Martin Volante is also fitted with this V8 engine with no option for the bigger V12 available. Both the AMR and DBS versions offer more aggressive styling and power. As of July 2018 there are currently 2960 Aston Martin DB11 car on the road worldwide. Our Aston Martin DB11 hire car is relatively economic to drive also, with combined fuel coming in 24.4 mpg, 16.2 mpg urban and 29.3 extra urban. 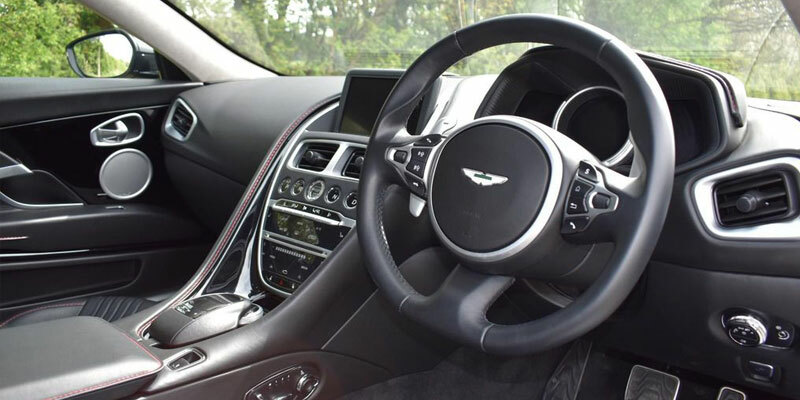 This Aston Martin DB11 hire car only comes with a paddle shift full auto 8 speed gearbox allowing the hirer to relax around town and then really get that racing car driver feel out on the country roads ensuring you are always in the right gear at the right moment. This Aston Martin DB11 rental car that we have for hire is slightly lighter than the Aston Martin DB11 Volante, coming is at 1740 kg as opposed to 1850kg for the volante. All of this weight distribution helps the Aston Martin DB11 corner nimbly, and predictably. The extra weight on the Aston Martin DB11 comes from the lower strengthening of the chassis to cater for the lack of roof. This slight weight difference however cannot be noticed at all, such is the immense design of the chassis that the handling is not affected in any way either. Our Aston Martin DB11 Hire options are very flexible. We are able to offer for hire our Aston Martin DB11 on a daily basis if you require it for a weekday wedding, or perhaps you may enjoy hiring it for a few days either side of the event, whether it be a 4 day mid week hire or 4 day weekend rental so you can really get a true supercar experience. 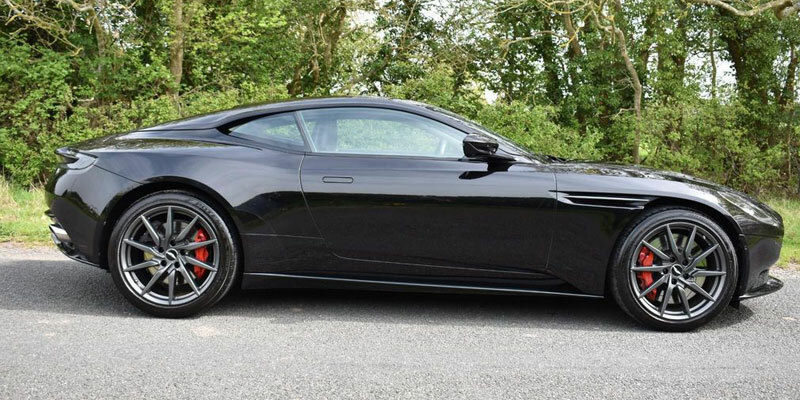 We also have some great deals and prices on a weeks' Aston Martin DB11 hire, or perhaps you have recently sold your supercar and need to hire the Aston Martin DB11 for a month while you wait for your new supercar to be delivered. We have also recently seen a trend for exotic car hire to be utilised for prom car hire. Whatever your reason for hiring, PB Supercar Hire has the supercar for you. 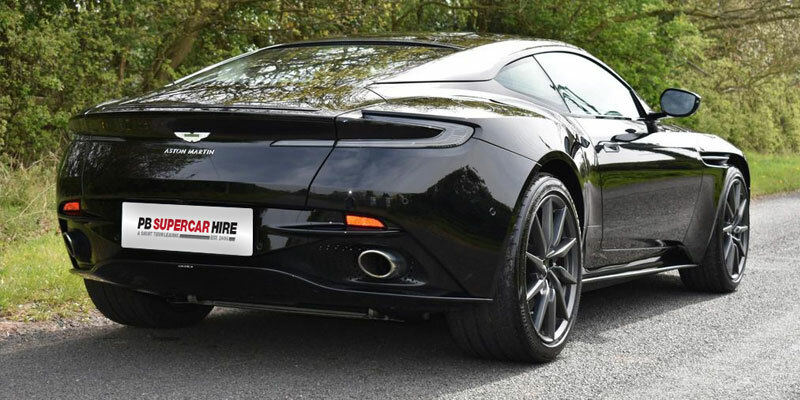 Hire this Aston Martin DB11 Supercar for an unforgettable hire experience or view our other supercar hire vehicles to choose your favourite supercar for whatever the occasion. 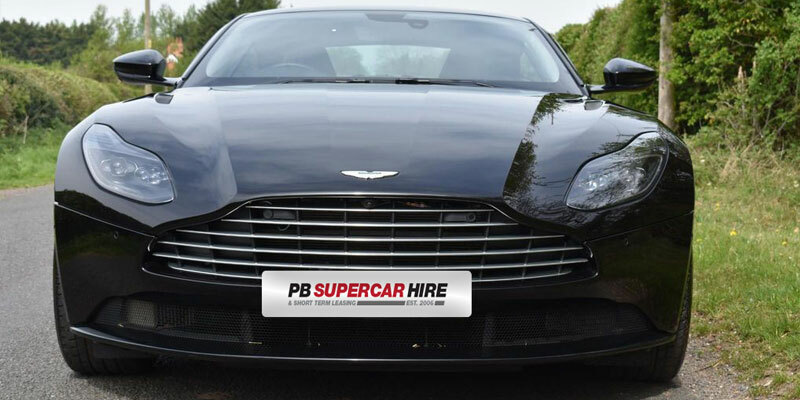 Most of the business we do at PB Supercar Hire with our Aston Martin DB11 hire car is with short term rentals ranging from 1-7 days usually for use for wedding car hire, which is great for a one off hire experience. However recently we have seen an increasing amount of enquiries and hires for longer periods ranging from 2 weeks to 12 months on our Aston Martin DB11. PB Supercar Hire offer great long term supercar hire deals and short term leases on our prestige car hire solutions. 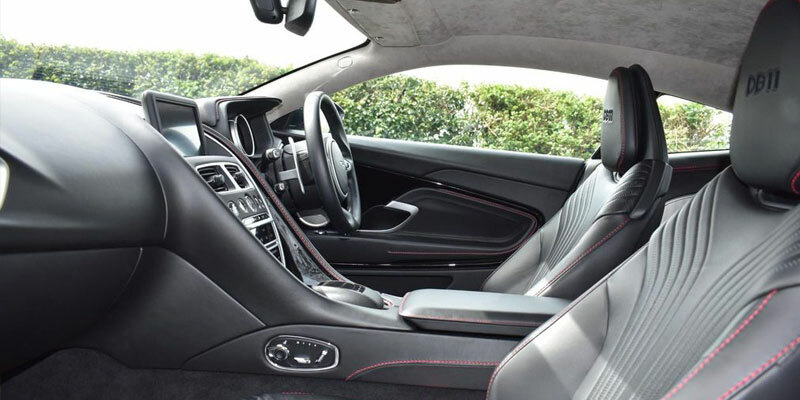 If you are looking for this type of sports car hire you will usually be accustomed to the pitfalls and problems with ownership, especially in London. 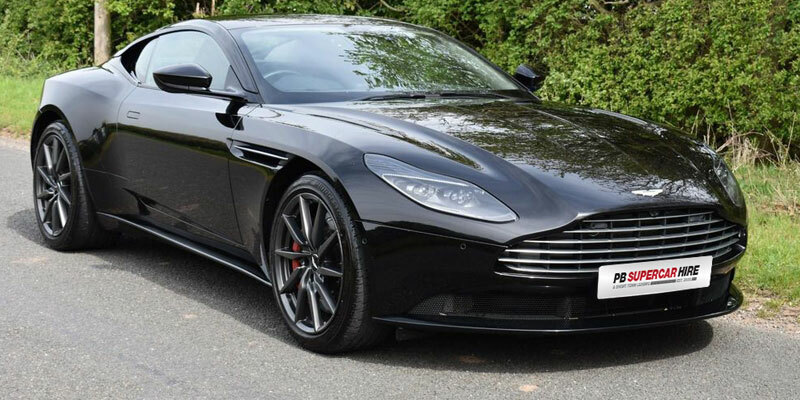 By hiring our Aston Martin DB11 for a longer period you will relieve yourself of the burdens of maintenance, insurance, tax, mot, tyres, finance costs and the all important depreciation. Just because you can afford an Aston Martin DB11 does not mean you have the money to loose thousands when it comes time to sell. We have carefully worked out that hiring our Aston Martin DB11 for a period of up to 12 months will work out financially better than buying one for the same period. If however you intend to keep the supercar longer than 12 months it is better sense to buy or lease one on a traditional 36 month deal. Quite often when you buy an Aston Martin DB11 it sits in your garage unused for days or weeks at a time, costing money and depreciating. 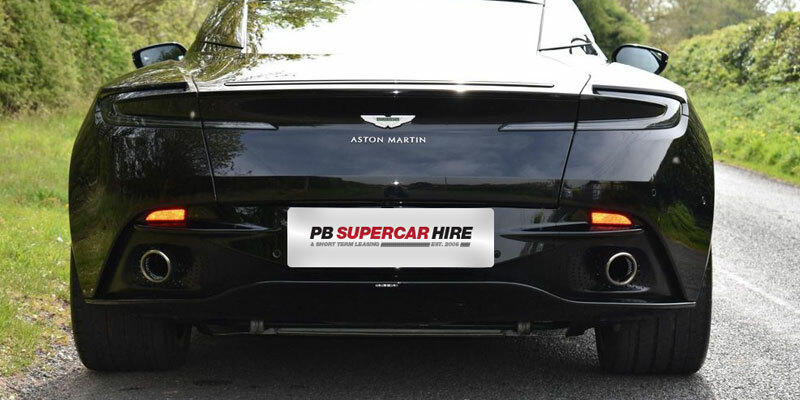 PB Supercar Hire has seen a large rise in this type of luxury car hire customer over the past few years, who have now chosen to sell their own supercar and regularly choose our Aston Martin hire options as and when they need a car often for a few weeks at a time." Aston Martin have long been associated with the world's most popular spy, from the much loved Aston Martin DB5 to the Aston Martin Vanquish. All of the cars that have been used by James Bond throughout the series - and there have been 12 films that have used Aston Martin's - have been available for public purchase, albeit without the gadgets and ejector seats. The DB10 showcases Aston Martin's vision for their future, with a new sleek look that will translate to all of it's 2016 production cars starting with the DB11 and al new Vantage. Where better to unveil a new style than by letting James Bond do it? The new style Aston Martin DB11 hire car we have features sharper creases with a shorter rear, although they have kept the front grille which is synonymous with Aston Martin even though it is lower and wider than previous models. The DB10 and DB11 makes the most of a lightweight aluminium architecture that goes hand in hand with the new batch of Mercedes AMG engines that the new models will be built with. Aston Martin was founded in 1913 by Lionel Martin and Robert Bamford under the name Bamford & Martin with the intention of making a vehicle that Martin could race at Aston Hill, which he had been doing previously. The first car to carry the Aston Martin name was a modified Isotta-Fraschini chassis to which Martin fitted a four-cylinder engine. The pair acquired premises in Kensington where they produced the car in March 1915, but they were interrupted by the first world war where both Martin and Bamforth served. In 1920 Bamford left the company, but it was saved when Count Louis Zebrowski - a feted racing driver and engineer - invested in the company and in 1922 Bamford & Martin began producing cars to compete in the French Grand Prix with their machines going on to set world speed and endurance records. Despite this the company went bankrupt in 1924 and was bought by Lady Charnwood, but despite this backing the company failed again in 1925 which caused Lionel Martin to leave. A number of investors kept the company alive including Lady Charnwood, Bill Renwick and Bert Bertelli; renaming it as Astone Martin Motors. Renwick and Bertelli had worked together for a number of years previously and were able to use the reputation Aston Martin already had to begin the production of a new car. The company produced road cars and race cars which enjoyed success at Le Mans and the Mille Miglia; but financial problems came back once again with the company almost going bust in 1932 until it was recused by Lance Brune, who passed it on to Sir Arthur Sutherland. Sutherland shifted the company's focus to road cars and they produced more than 700 models of tourers, saloons and dropheads before the second world war halted production. David Brown is commonly known as the saviour and allowed us to be bale to offer a fleet of Aston Martin hire cars. Taking over from his father David Brown Senior after he bought the company in 1947. David Brown acquired the Lagonda business for it's Bentley engine, moving Lagonda to Aston Martin and sharing engines between the two. This was the beginning of the Aston Martin DB range which became iconic. Brown's early DB cars performed well in Le Mans races and helped to build the brand as a racing pedigree, but it was the DB4 and in 1963 the DB5 which stood out from the crown. James Bond helped with this with the 1964 film Goldfinger having Bond drive the DB5. Brown was also responsible for saving the company once again by paying off all of it's debts and selling it for a pittance to a business consortium. However this led to further trouble and in the midst of a recession, the company had to close its US factories and Aston Martin was once again in receivership. In 1975 the company was bought by North American and Canadian businessmen Peter Sprague and George Minden they changed the branding to Aston Martin Lagonda, bringing in British property developer Alan Curtis. Later in 1975 the factory reopened and before long had orders for cars from America, Japan and other international markets; with Curtis as MD pushing to develop more lines like the Vantage, Volante and Bulldog. Despite enjoying success with Aston Martin, Sprague and Curtis sold it to petroleum magnate Victor Gauntlett in 1981 who was able to bring Aston Martin back onto the silver screen in another bond saga - The LIving Daylights, which saw him driving Gauntlett's own pre-production Vantage. A meeting between Gauntlett and Walter Hayes, VP of Ford Europe, in 1987 led to Ford eventually taking a leading stage in the company in 1991. Ford immediately began work on revitalising the DB range, introducing the DB7 to the market in 1992. Ford modernised the production line of Aston Martin, with 4,000 DB7s being build within 4 years - a record production level for the company. Ford would go on to develop more DB ranges including the DB9 to replace the DB7, introduce the AMV8 Vantage concept car and the V8 Vantage. They brought motor racing back into AML's heritage in 2005 with Aston Martin Racing and a company called Prodrive responsible for design, development and management of the programme. In 2007, a consortium led by David Richards - chairman od Prodrive - bought Aston Martin Lagonda for £475m, with Ford keeping a £40m stake in the company, this investment allowed Aston Martin to develop and produce the DB11 we have for rent.